It is official — Ally will be having her surgeries/procedures THIS WEEK at Lurie Childrens Hospital in Chicago. We will be admitted on Monday 10/1 at 2 pm to order TPN (IV nutrition), surgery will be on Tues 10/2 to receive a port (for infusions, blood draws, IVs..) a couple of releases on her tight left foot and possible a broncoscopy (to check her trach and airway), then infusions of pamidronate to hep her build bone density on Wednesday and Thursday. The BIG goal of this is to prevent future fractures and also have easy access as needed for blood draws, IVs and infusions (which will be done every 4-6 months, but out-patient). We hope to be home by Thursday 10/4 in the afternoon or evening IF everything goes smoothly!!!! I am a bit nervous, excited and scared, all at the same time. This will be our first hospital stay at the new Lurie’s Children’s Hospital which is in the center of downtown. Things have been a bit complicated with Ally lately. We lost our full time nurse due to back problems with lifting and have started training 3 new, very nice, part time nurses. Our other nurses who had been with Ally from 2-4 years are also doing other things in their careers which are overall higher paying than homecare and we remain friends. Our main goal is to having nursing Monday thru Friday days and 1-2 evening shifts, so we will need 1-2 additional nurse, but I’m hopeful. Ally has NOT started school this year. We have run into MANY roadblocks with finding a better, accessible school, with an active parent community, and a principal that will accept her with her home nurses and me filling in/training as needed. Chicago principals seem to have a lot of power and several have said NO to handicap kids out of their attendance area (even though our home school is not accessible) and some have said NO to using our home agency nurses, wanting us to use agency nurses paid by CPS. This is NOT safe for Ally and right now she is being denied a safe, appropriate education in the least restrictive environment. We also have not even started homebound school yet. We are working on getting a teacher and therapists to come to our home while we advocate and fight for to go to school with friends and lots of fun educational activities that enrich her life. Luckily I have reached out to Equip for Equality, a free pro-bono, law group and there is a good chance I will help getting Ally the safe, education she deserves! In the meantime, I have been focussing on training our new, home nurses, planning for her surgery and dealing with some of my own medical concerns. 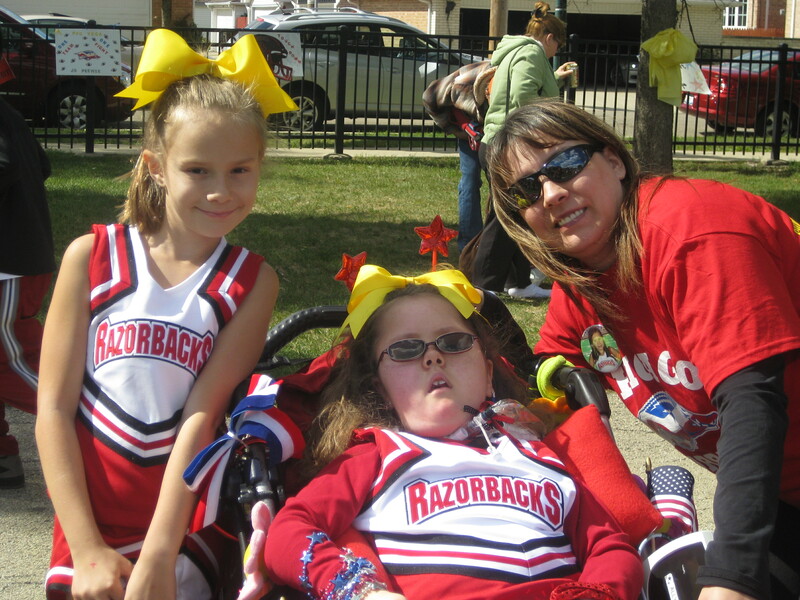 Melissa started her new season of cheerleading with the Chicago Razorbacks at Shabbona Park and absolutely LOVES it! She is a flyer and has a ton of spirit. She cheers on Sunday for the football team and will have her first competition on Sunday, October 27th. The team has been extra nice in accepting Ally as a honorary mascot with the other 6 year olds on the team. She has her own uniform and gets to be near the sideline for home games. To raise $$$ for this brand new team, we are selling Cookie Dough which comes in proportional cookies (instead of tub). 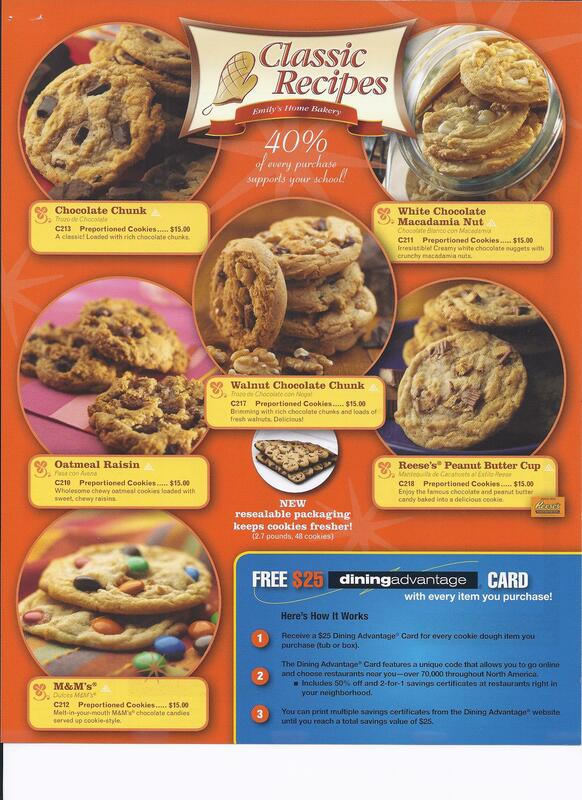 4 dozen cookies are $15 with 40% going toward the team. Check out the flyer and let me know if you are interested. Our goal is to sell 15-20 items and if we are the highest seller, cheerleading fees would be waived next year. Orders and payment due Oct 10th (checks payable to Chicago Razorback) sent to us at 3614 N. New England, Chicago, IL 60634. Approximate delivery Beginning of November. Kristyn has also begun her new cheer season at Lane Tech. They had their homecoming game this past Friday and did an amazing job. She is a junior and is even taking some AP classes this year. Here’s a pic of her team. 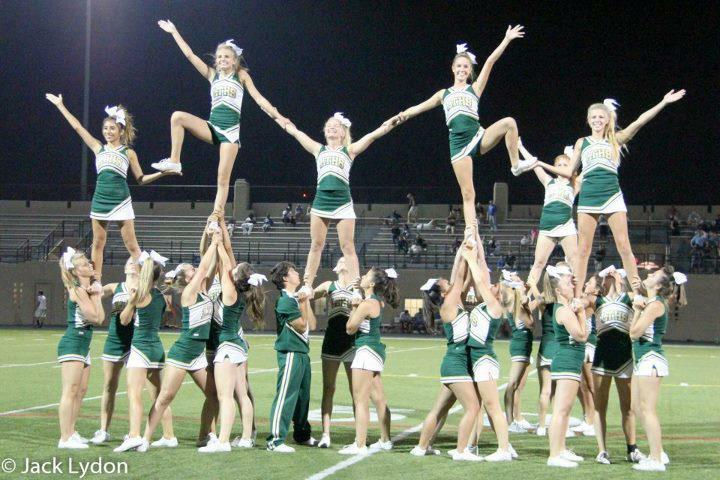 She’s the 2nd flyer (on top) from the left side. That’s about all for now. I will try to update as I can after Ally’s surgery this week. Thanks for everyone’s support and prayers!!! I will try to update more details soon, but wanted to be sure to share our EXTRAORDINARY pictures and a short video from Center for Courageous Kids. A HUGE thanks to ALL those who donated to help Ally, our family, and other medically fragile families attend the BEST weekend of their lives. This is our 3rd year attending SMA Family Weekend at Center for Courageous Kids in Scottsville, Kentucky and we hope for MANY, MANY more!!!! Be sure to click on the album cover below to see ALL the pictures…. We are still collecting donations. We are at a little over $1000 to help keep this camp functioning, but our BIG goal is $2000 or MORE. Please consider collecting and donating items in honor of Ally, her friends and our family to Center for Courageous Kids (CCK). Thanks in advance for considering to help and those who have already!!!!! WILL YOU BE THE NEXT TO HELP WITH A DONATION? PLEASE consider a small donation knowing that it allows Ally (and our family) an EXTRAORDINARY Camp weekend with horseback riding, glow bowling, woodshop, arts and crafts, scavenger hunt, great food with unlimited ice cream, swimming… and time with other kids and families like ours. We were specifically asked if we could possible get a Chicago restaurant gift certificate and/or tickets to Chicago attraction (with a longer expiration date for someone who would LOVE a Chicago Vacation) for a FUNdraiser in October. We need to collect these this month. Do you have any connections, or are you able to help? 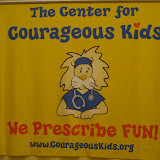 http://www.thecenterforcourageouskids.org/needs_list.html People often ask us, what is your largest need? How can we help? Our answer is always,“make a financial contribution, large or small.” Each and every penny matters. The daily operation costs are endless. Without financial support from individuals and the community at large, we would not be able to continue serving so many brave campers free of charge. We are a 501(c)(3) not for profit corporation and ALL gifts are tax deductible to the full extent provided by law. Here is how YOU can financially support the BRAVEST kids we know! *Make an online contribution by clicking the “donate now” tab in the upper right of the screen. Mail your donation to camp (1501 Burnley Road, Scottsville, KY 42164) *Join our monthly giving campaign, the “Twenty Twelve” Club. By making a small monthly donation of just $20.12, you will be making a HUGE difference in the life of a medically fragile child. At your next event, donate a percentage of sales or proceeds to The Center for Courageous Kids. *Make a gift in honor or in memory of a friend or loved one. *Name a bed ($1,000.00) (naming opportunity – plaque on bed) *Help sponsor a camper ($1,000.00) (naming opportunity- plaque on donor wall) *Full camper scholarship ($2,000) (naming opportunity –plaque on donor wall) *Donate Gift Cards: Itunes, Hobby Lobby, Dollar General, Office Depot, Staples, Wal-Mart, Lowe’s, Home Depot, Phone Cards, Gas Cards, etc. These gift cards allow us to purchase, as needed, supplies for our camp program areas. In-kind Donations of Services: The fundraising team are always needing items to put in fundraising auctions, where all proceeds benefit our campers. 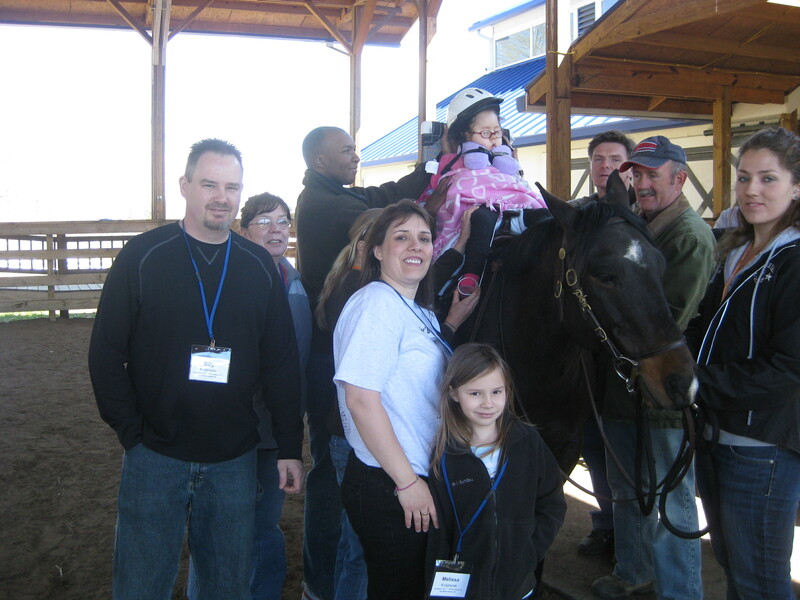 Our special events are vital in helping us reach our fundraising goals. Auction items that are always needed: *New items with tags and in their original packages. (Baby products, candles, spa products, kitchen supplies, books, Christmas decor, home decor, prints and pictures, etc.) *Autographed guitars, prints, posters, t-shirts, etc. *Sports items (autographed basketballs, autographed race cars, game tickets, etc.) Vacation donations: If you want to donate a weekend/week stay at your special place on the beach, or that rustic lake house, please contact Stormi Murtie, Director of Communications at (270) 618-2900 with trip details. Trip donations are a great way to raise money for camp and are VERY popular with our auction guests. *Weaved Baskets or totes *Shrink wrap *Bows *Tissue Paper (all colors) Camp Program in-kind donations: White Cotton T-shirts of various sizes Sunscreen (SPF 45) Lotion bug spray (Deet Free) Various medical supplies We appreciate any and ALL forms of support. Any of the above needs listed are ones that are vital to the daily operations of The Center for Courageous Kids. It is because of YOU, that we are able to provide such an AMAZING camping opportunity to the medically fragile children we serve. MANY THANKS, The Center for Courageous Kids staff and family (including the Krajewskis)! 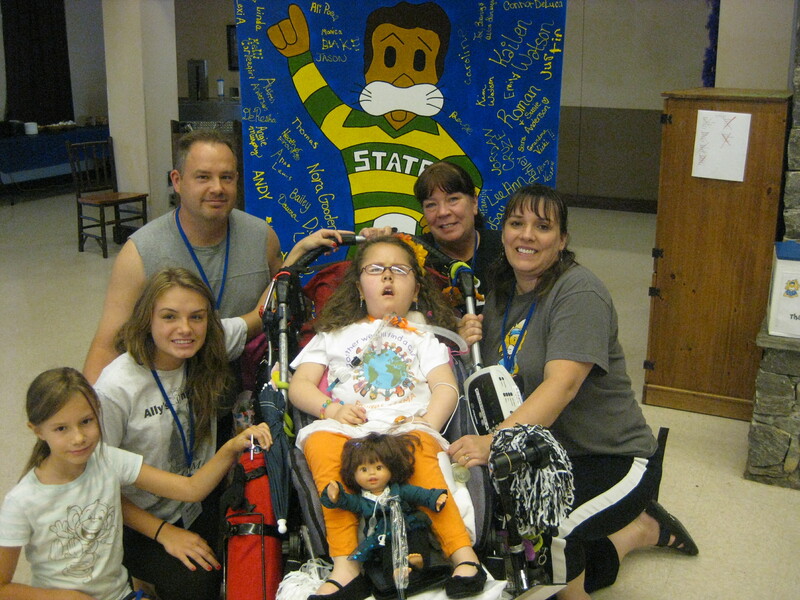 ONE WEEK till we get to go to Family SMA Camp Weekend at Center for Courageous Kids!!!!!! We are at $700 (+ travel $) in donations with a goal of $1000-$2000. WILL YOU BE THE NEXT TO HELP WITH A DONATION? PLEASE consider a small donation knowing that it allows Ally (and our family) an EXTRAORDINARY Camp weekend with horseback riding, glow bowling, woodshop, arts and crafts, scavenger hunt, great food with unlimited ice cream, swimming… and time with other kids and families like ours. SMA family weekend at Center for Courageus Kids in KY September 7-9th 2012. Contact Tina (tina@angelally.com or 773-283-7211)if you are interesting in donating by check or collecting supplies for the camp. It is tax deductable. THANKS from the bottom of our hearts!!!!! *Join our monthly giving campaign, the “Twenty Twelve” Club. By making a small monthly donation of just $20.12, you will be making a HUGE difference in the life of a medically fragile child. At your next event, donate a percentage of sales or proceeds to The Center for Courageous Kids.